Historic gingerbread cottage located in a small, quiet, friendly circle of cottages in the Martha’s Vineyard Camp Meeting Association in Oak Bluffs. Enjoy the best of both worlds, with the solitude of sitting in the rocking chairs on the front porch of the cottage or with walking just a couple of minutes to the hustle and bustle of Circuit Ave. for grocery shopping, boutique shopping, or dining. Also take a short walk to Jetty Beach, the Oak Bluffs’ island ferries or the Flying Horses. This charming, historic cottage is perfect for a family vacation. 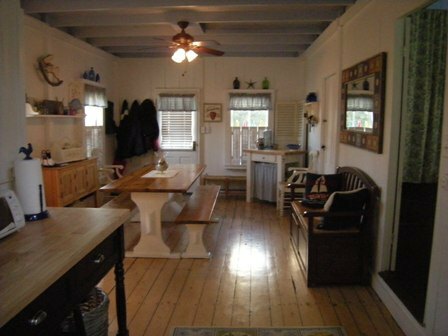 The cottage consists of a living room, dining room, new kitchen, new full bathroom, and 3 upstairs bedrooms. Weeks also available in June and September. Please call Sally at 508-873-2795 or email [email protected].